Wealth Informatics writes about emergency funds with $1000 emergency fund? 6 months expenses? 1 year salary? Throw them all out the window! They also looked at the Spent game I wrote about this week. 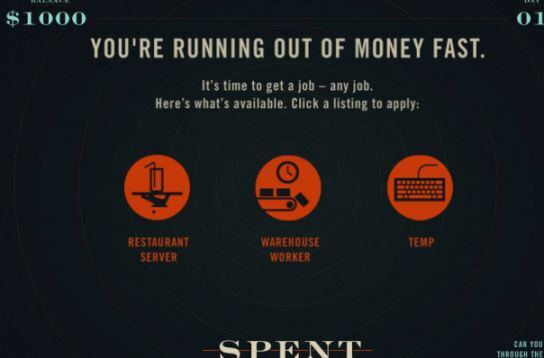 The online game called Spent illustrates what it is like to be in a working poor situation or low income job. The game is interesting. It points out the various costs that can hit you unexpectedly and notes how various every day costs can be extremely hard for low income earners to handle. I will fault the game for being a little unrealistic since it seems to throw disaster after disaster at you. A typical week does not include a car accident and $100 bill from a neighbor breaking your window which your sinister slumlord expects you to pay. And yeah the times I've played any interaction with a landlord makes out the landlord as an evil moustache twirling sinister villain who blatantly breaks laws. As a landlord myself this is an unrealistic and blatantly unfair stereotype. But its common enough that it can happen... just like a car accident or a medical bill or another unforseen bill or even common bills. Still while all these emergencies won't happen in a given month, its likely that they will happen sooner or later. If you live paycheck to paycheck then its only a matter of time before an emergency or unexpected cost or even daily bills will empty your bank account. If you answer all the questions the right way and have some luck than you can win. I've won a couple times playing the warehouse worker. However I did have to work with a sore back and persevere through other hardships. Hey, who said being poor was fun? Maybe its not super realistic but it has a point. 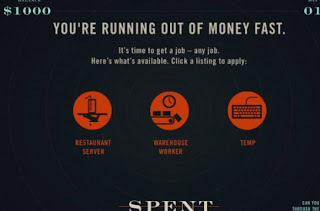 The game is interesting and illustrates pretty well that living on low income is not fun. The cost of homeowners insurance varies surprising from one state to another. The average cost in Texas is nearly 4 times as much as average for Idaho. Thats a big deal that many people may not think of when looking at cost of living or moving from one region to another. The Insurance Information Institute lists the average cost of homeowners insurance by state for the year 2008. They got the information from the National Association of Insurance Commissioners. Source: © 2010 National Association of Insurance Commissioners (NAIC). Reprinted with permission. Further reprint or distribution strictly prohibited without written permission of NAIC. The * for CA, FL & TX are because each of the figures from those states are due to slight differences in how the numbers are recorded or reported. So they are not a strict apples-to-apples comparison to other states. Couple notes: ThesseMcMansion is much more expensive to insure than a modest starter home. Now lets look at the data graphically. 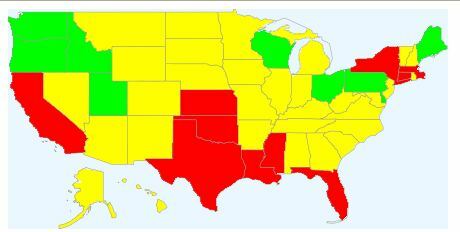 Now you can see that there is a large difference between states in the amount that homeowners insurance costs. There are many reasons that insurance rates differ from state to state. I assume that the primarily difference in costs is due to differences in the frequency of natural disasters. Many of the things that insurance might pay for don't differ from state to state like fires or dog bites. You can also see the huge bills that insurance companies can see for significant disasters like hurricanes and floods. Other than natural disasters there can also be differences due to the average cost of housing. The average cost of insurance will naturally be higher in California than in Idaho if everything else is equal. Crime rates and government regulations can also impact the costs state by state. Personally I live in a relatively low cost area for home insurance. The Northwest has few natural disasters except for an occasional volcanic eruption. Compare that to a state like Texas which can see hurricanes, tornadoes and hail storms. How does your home owners insurance compare? Right now you can get $2 in free MP3 download credit from Amazon. 4. Download your free tunes. $2 is enough to get a couple individual songs. I do not know how long the code will work, but its undoubtedly a limited time offer. You can also find various free MP3 downloads at Amazon. For example Feels Like The First Time from Foreigner is free right now. There are a variety of other artists with free songs on Amazon so they're sure to have something you'd like. A lot of the free songs are from 'up and coming' artists (i.e. people you've never heard of) who are trying to get some exposure. However you can also often find free MP3s from well known established artists who are just giving away a freebie as a promotional deal. I heard about this from Fatwallet. The grand prize for the Monopoly game is $1,000,000. But there is an ( * ) asterisk by that $1,000,000 prize. You don't get a lump sum of 1 million dollars. The prize is actually paid out in $50,000 yearly for 20 years. This is not uncommon for major prizes. Most lotteries pay out prizes like this. Getting paid $50,000 a year for 20 years is not the same as having $1,000,000 today. First of all its common sense, everyone can see more value in having $1M today than $50k a year. (Some people may prefer to get the money spread out so they don't blow it all at once, but thats a different matter.) Inflation and the effects of interest are the main reason that money in hand is worth more than money spread out over years. Lets look at the $50,000 paid out on year 20. Thats not worth $50,000 today. Clearly $1 in 2031 will not buy as much as it does today due to inflation. If you assume 3% annual inflation then $50,000 in 2031 will be equivalent to about $27,683 in todays dollars. Nearly half as much. One simple way to figure out how much equal payments over time equates to in todays dollars is to find out how much an annuity would cost. You can buy an annuity that pays you $50,000 a year for 20 years. This kind of annuity can be bought with guarantee that each year will be paid regardless of how long you live so its not like other immediate annuities that depend on your lifespan. The cost of that kind of 20 year fixed annuity is a good approximation for the value of that kind of payout. paying $50k a year (4167/mo) would cost = $724,696. The $1,000,000 prize from McDonalds Monopoly game is equivalent to a 20 year period certain annuity paying $50,000 a year which would cost $724,696. Therefore the McDonalds Monopoly grand prize of $1,000,000 really has a cash equivalent value of $724,696. But its still a fun game. Gold Crashes $100 in a Day... Sign of More to Come? On Friday the price of gold dropped over $100 an ounce. That is the largest single day dollar value drop in gold prices on record. The $100 drop is a 6% drop in one day. Gold peaked at a whopping $1895 earlier this month on Sept. 5th. With it now trading at $1657 that is a drop of 12% within 3 weeks time. For a while I've had a negative outlook on gold prices. 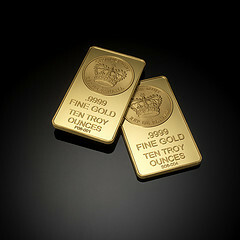 I've felt that gold was in a bubble that is going to burst sooner or later. Last year I gave my thoughts on how fast could gold drop? It can drop a lot in not too short a time. Gold has dropped as much as 43% in as short as 2 months. And over 2.5 years from Jan. 1980 to June 1982 it lost 65% of its value. I also considered the question Is Gold a good inflation hedge? My conclusion was that it isn't really. I'm still of the opinion that gold is in a bubble and it will eventually pop and drop in value considerably. It could drop another 20-50% this year. Heck why not... I'll go ahead and put myself on record with another prediction on gold prices. I am thinking gold will drop under $1300 by the end of 2011 and then be under $1000 by the end of 2012. But given my poor record predicting the direction of gold prices I wouldn't bet anything on my predictions. Its also possible that gold could recover and then double in value within 12-24 months. We'll just have to wait and see. For the record, I do not own any gold or gold investments. My wife had some shares of a gold mutual fund but she sold it. I'm not sure exactly what her return on that investment was. One of my credit cards has a free feature where I can see my TransRisk credit score. 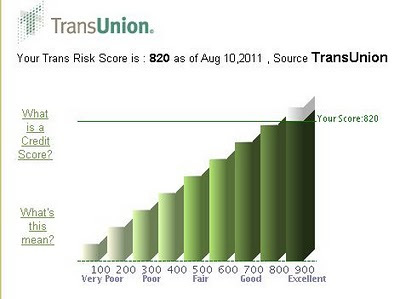 The TransRisk score is from the TransUnion credit bureau. Its not the same as a FICO, but its supposed to be similar. The TransRisk has a different formula and range of scores than the FICO scores. As you can see it maxes over 900 which is higheer than the FICO max so 820 on TransUnion is not equal to 820 on a FICO, but its still good. Suffice it to say my score is pretty high and I'm happy with that. I am not generally worried about my credit score as long as its in the 700+ range. However I do want to make sure the score stays fairly high cause that will help us keep our insurance rates lower and help us get the best % rate on a mortgage if when we do buy our next home. The 'deal of the day' sale at Amazon.com is a Honeywell RTH7600D Touchscreen 7-Day Programmable Thermostat on sale for $49.99 which is half off. Fifty bucks is a good price for a programmable thermostat and this is a nice touchscreen model. I don't own one but the reviews on Amazon are very good with over 200 people giving it 4.5 stars average and 180 people giving 4 or 5 star reviews. That means people really like the thing. I guesstimated then that turning down the heat at night was saving me about $80-90 at the time. Thats based on using less heat during the night versus keeping the heat set at 72 for 24hrs a day. In my mind the key with the programmable thermostat is that it automates turning down the heat and never forgets. But be clear that a programmable thermostat is not magic and doesn't do anything you couldn't do yourself by diligently turning the heat up and down manually. Which I talk about more by answering the question : Why are programmable thermostats better? Another point I made in that article was that contrary to what some people think : NO, turning the heat up and down does NOT hurt your furnace or cause the furnace to work harder than just keeping it on. But there is an important detail is that if you use Programmable thermostats with heat pumps, steam heat and radiant floor heating then you need to get a special kind of programmable thermostat that is designed for use with your heating system. Typical programmable thermostats are designed for forced air heat systems and the other heat systems operate differently so the normal programmable thermostats won't work well with them. Back in March I mentioned that my wife and I were home shopping. At that time we'd already looked at over a dozen homes. Since then I've lost track of the houses we've looked at. Our home shopping has been on and off over the past few months. We put the shopping on hold at the start of summer since we were simply too busy to look for houses or buy a house and move. The market here has been pretty stale in the last month or so. There are few houses coming up for sale. Unfortunately we still haven't found any homes that really fit our needs. The average sales price in the ZIP code we're looking at has gone up from $164 / sq ft to $166 / sq ft. We're looking at homes around 2500 sq ft so that equates to a $5000 increase. Not much of a change for homes in the $400,000 range really especially given that the summer is the high season for home buying and selling. Interest rates have dropped a full point since we started looking. I have an old quote from our mortgage broker back in February listing a mortgage rate of 5.1% and today it should be easy to get 4% rate. We've saved up about $30,000 more cash compared to when we first started looking at houses back in February. Thats more money we could use towards a downpayment and/or keep in our emergency fund. Lets look at buying a 2500 sq ft house at average sales price. The drop in mortgage rates means that buying a similar home today would give us a mortgage payment that is $195 less per month compared to back in February. Thats a big deal. Plus since we've saved up more money over that time period in cash we could buy a house now and have a lot more left in our savings account. Thats a big deal. Its actually a good thing for us financially that we haven't found a house yet since the mortgage rates have dropped so much. We can now buy a lot more home for the same money or buy the same home for less money. We do not 'need' to buy a bigger home now. Thats given us a lot of flexibility to be picky in our house hunting and wait for a home that we really like rather than settle for the best home available. If you order 20 4x6 photos for 10¢ thats $2 and then use the $2 coupon should result in $0 cost. A while ago I wrote the article Do Stock Values Drop After Dividend Payouts? and I discussed how yes in fact dividend pay outs do reduce the market value of the stocks. A commenter on that thread pointed out that the company Giant Interactive was going to have a large one time stock dividend. That would be a good opportunity to see the phenomenon in action. "Special Cash Dividend. The Board of Directors has declared a one-time special cash dividend of $3.00 per ordinary share or ADS. The special dividend is payable to shareholders of record on August 31, 2011 and is expected to be paid on September 9, 2011. The Board of Directors approved this special dividend to give value back to shareholders, as the current cash position exceeds the short-term needs of the Company and cash flow from operations continues to be positive. The total amount of cash distributed in this special dividend is expected to be approximately $708.2 million net of one-time accrued withholding tax associated with the repatriation of cash for this special dividend intended to be paid, but may be subject to offshore withholding/income taxes and handling charges." The stock was trading at $7.80 on the day of September 9th. So the $3 dividend should be clearly visible in the market value of the stock and it was so. Here's the Yahoo chart for the days around that dividend. From the historical prices for GA we can see that on Friday Sept 9th the stock closed at $7.80, then the dividend was paid out for $2.99 and on Monday Sept. 12th the stock opened at $4.77. The difference in closing and opening for the stock is $3.03 which is just a few cents away from the $2.99 from the dividend. So there you go a clear example of how a dividend pay out reduces the market value of a stock. Today through Thursday you can get a Tivo Premier DVR with Lifetime subscription service for $449. Thats $150 less than the regular price. Right now my DVR from Comcast is $16 per month + $1 in taxes so its about $17 a month. In a year I spend $204 on my DVR. If I buy the Tivo then I'll break even in less than 3 years. Three years ago I did this same calculation. I figured at that time that if I had spent $700 on an HD TIvo with lifetime service that I would break even in 3.5 years versus paying $12/month for my Cable DVR. But I didn't buy the Tivo then and I've just stuck with the Comcast DVR for the past 3 years. Now my DVR is $16 a month instead of $12 a month. I used my first Tivo for 5 years. I actually still have it but its not HD compatible so we don't use it now. I spent $249 on the lifetime service on that box and it is still valid today. If I had spent $12 /month on DVR service then I would have spent $702. Spending $249 saved me $702 over 5 years. That was a great deal. I don't know why but I'm still very hesitant to buy a HD Tivo today. The lifetime subscription on my first Tivo saved me hundreds of dollars in monthly fees. I can look back at my older post from 2008 looking at the HD Tivo with Lifetime for $700 and see that I'd be ahead by now if I'd taken my advice then. And I know that if I paid the $449 today to buy one that I'd make my money back in 2.5 years. Yet with all that good evidence that it will be a good long term buy I am still hesitant to plop down $449 today. The one legitimate reason to stick to the Comcast DVR is that you can not get Comcast on-demand content via the Tivo unit. That might change soon since it appears Comast on-demand may be available on Tivo in the future. Thats a recent development and hasn't been implemented in my city and theres no indication of when it might be. We do use the on-demand content from Comcast a bit so losing that would be a negative for us. I'm not sure if we use it enough to justify the extra cost though. I guess the primary reasons I don't buy the Tivo are the large up front cost and simply sticking to the status quo. Its hard to commit to fork over a few hundred dollars up front. Even though I know its better overall cost in the long run. The status quo is easier since I don't have to switch boxes and my wife and I won't have to learn how to use the Tivo. Not that using a Tivo is hard at all, in fact its easy. But we'd still have to get used to a different interface. The $449 deal is a good deal though. Wikipedia has a list of the minimum wages by nation. They give the values in the base rate for the country and then convert it into a "international dollar" figure which is an artificial figure used by economists and as a % of GDP per capita. Neither of those figures mean too much to most people. I figured it would be useful to translate the minimum wages into U.S. dollar (USD) figures instead since that has more meaning to most of us. I used the currency converter and used those figures to translate to USD. I got the data on August 5th. I did the research on this one a while ago so thats why its a little old. Of course currency exchange rates do fluctuate daily so those conversions are now out of date. There isn't a large difference in exchange rates within a month so its still pretty close.. But at least this gives us a reasonable snapshot as of August 5th, 2011. Also keep in mind that the laws in each nation change every so often and its likely that the data in the Wikipedia article is either already out of date as I write this or soon to be out of date for one or more nations. 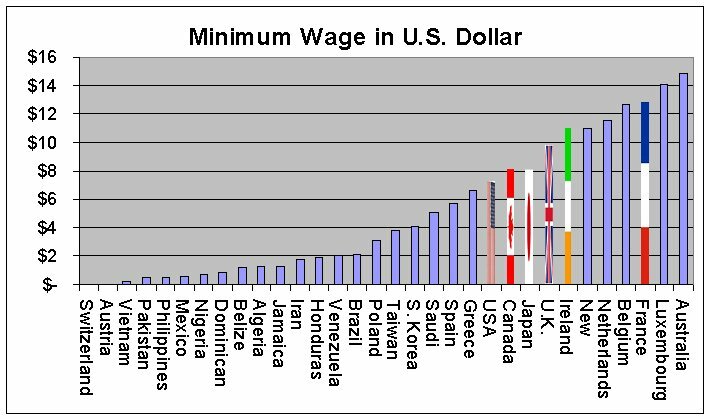 Note : There is extra detail in minimum wages for each nation that isn't reflected here. I simply lifted the numbers from wikipedia and then converted them to US currency. There is undoubtedly various rules that apply to minimum wages like how in the USA servers who get tips can get less than the full minimum. Some nations have a minimum age of 21 years to get the full minimum wage and some minimum wages vary from industry to industry. The fact that Switzerland and Austria have no minimum wage should not be taken to mean they have low wages. Australias minimum wage seems pretty high at $14.88 USD/hr. But again I'm sure theres more to the story on many of the minimum wage figures. I'm not going to make any kind of conclusions from this. 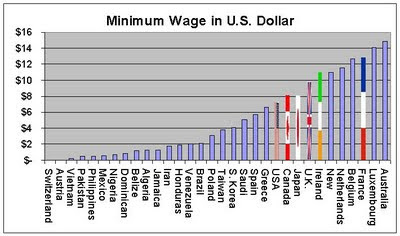 I'm discussing it just because I think its interesting data to see how minimum wages vary around the world. "Dew found that a couple with $10,000 in debt and no savings is twice as likely to divorce as a couple with no debt and $10,000 in savings"
A married couple that has debt and no savings will have more arguments about money then a couple with savings and no debt. Money can cause a lot of friction in a relationship and lack of money causes the most friction. Even if the couple doesn't argue about money per se their poor financial state will add stress to their lives which and then that stress could make the marriage more difficult. Think about it this way: Are you generally in a happy mood when you're in debt? If you're not generally in a happy mood then is it more or less easy to get along with your spouse? Think about the married couples you know who are having financial problems and the ones that are doing well financially. Which group has more happy couples? You may find a pattern there. A friend of my wife has had a lot of difficulties in her marriage and almost all of it has been due to their handling of money and the debts they have. One of my friends just got a divorce after a short marriage and a lot of their arguments revolved around money. fivecentnickel asks Is the Home Mortgage Interest Tax Deduction a Good Deal? I wrote something along those lines a couple years ago How many people benefit from Mortgage Interest Deductions? I found this deal in my email inbox from Ebates today. Vistaprint has a deal for a free photo wall calendar plus a $5.67 charge for 'slow' shipping. They advertise it as free but you have to dig into their site to find the shipping costs. Still seems like a pretty good deal. Might make a nice Christmas gift. You can also get 5% cash back via Ebates when making a purchase at Vistaprint. I just got off the phone with the buy from the Toyota shop. The car has been due for maintenance and it had the engine light on for a while which I'd neglected. I knew the engine light was an oxygen sensor since I had that checked for free at Autozone one time. However the car was also leaking a fluid this afternoon so I figured I had enough reasons to stop procrastinating and get the thing serviced. I took the car in and he figured the leak was just water condensing off the AC which they did confirm. But they also found that my breaks were in need of new pads which is no surprise to me since I haven't had that done and I've put about 40,000 miles on it. I went ahead and had them do it. Then I got that fear that I'd just casually agreed to over pay for services without shopping around. I know I should shop around for this kind of stuff. But sometimes my own lazyiness and ease of just going with the shop I took it to wins over and like today I just go with the easy route. For all three items the total range of prices in my area would be $971 to $1471. My bill of $1200 is in the middle of that range. Thankfully I didn't grossly over pay and I don't feel I am getting ripped off or anything as I feared. Thats a relief. But its just as likely that I would have at a shop wanting to charge me several hundred more than the average prices. If you don't shop around then you run the risk of ending up at the highest priced service. It is for U.S. customers and new subscriptions only. This is direct from the publisher. I'd still shop around to make sure you can't get it cheaper elsewhere but I doubt you'll find lower than $5 for a subscription. Bargaineering asks and answers the question What Are Structured Settlements? Robet Brokamp also at GetRichSlowly tells us What Will You Get from Social Security? and the answer is not 'nothing'. MyMoneyBlog talks about New Laptop? Extend Your Warranty By A Year For Free With American Express which is a nice side benefit of an Amex card which will work for more things than just a laptop. Did you know that winning millions of dollars in the lottery can actually increase your wealth? Its a little known fact. Of course if you read the news stories about lottery winners they all seem to be about people who lost all their money in a few years and ended up bankrupt and drunk in a ditch somewhere. It almost seems that its an accepted fact that winning the lottery will make you go bankrupt. I don't blame the press for reporting on the bankrupt lottery winners. A story headline about someone who won millions and lost it makes for interesting reading. On the other hand a story about someone who won millions and then still had millions a few years later isn't all that compelling of a topic. Imagine that headline "Local Lottery Winner Still a Millionaire". Not exactly news is it? Just like "Man Stabbed by Burglar" is news but "Man Sits in Home Quietly Watching Television then Goes to Bed" is not news. I also think theres a bit of 'sour grapes' involved. Doesn't everyone really secretly want to be rich? Hasn't everyone fantasized about having a big pile of money to do whatever they want in life? Ok, probably not everyone but I bet 99% of us have. So when you hear about a rich lottery winner you can get a little jealous. I want to win the lottery. If I hear news about how the lottery allegedly ruined someones life then that makes me feel a little better about the fact that I haven't won the lottery myself. Thats 'sour grapes' thinking right? I didn't really want to win the lottery cause doing so just makes you go bankrupt. about some happy lottery winners. I've also occasionally caught The Lottery Changed my Life television show which tells the story of many successful lottery winners and how winning the lottery has improved their lives. Yes clearly there are many lottery winners out there who are doing just fine. Many others are avoiding the spotlight. One of the things you often hear about winning the lottery is that it causes many people to come to you seeking free money, trying to sell you investments or otherwise trying to get some of your money. So if you're smart you'd do what you can to avoid that spotlight. Now having said all that, I do believe that there are many lottery winners who do go bankrupt. Many people don't know how to handle their finances. Something around 50% of Americans life paycheck to paycheck. More often than not that is due to poor financial habits as much as anything. When those same people get a large windfall they are likely to mismanage it just like they used to mismanage their paychecks. Winning the lottery doesn't make you magically good at dealing with money. Many if not most people just aren't very good with money to begin with and so a lot of lottery winners are not good with money. People who have large windfalls also have a tendency to go overboard with spending since they are now rich they feel they can spend whatever they want, cause they are rich after all. The hard part is properly managing the money so that it lasts. If you take home a giant jackpot of $10,000,000 then you may get an invincible feeling that you have enough money to last forever. But its really not hard to blow $10 million in a few years. Not hard at all. And you don't even have to go extremely overboard buying private jets or using inverted Jenny stamps* to send post cards. If I gave you $1 billion tomorrow I doubt you'd worry too much about how you spent it since that amount of money is so large it feels as if it will last forever. $1 billion may very well last forever past how fast you could reasonably spend it. In a lot of ways $10,000,000 may feel like as infinite as $1,000,000,000. yes theres more zeros in a billion but theres a whole lot of zeros in 10 million too. Enough to last a long time. Lottery winners really shouldn't go bankrupt, but they sometimes do. We only tend to hear the stories of the bankrupt lottery winners since the story of lottery winners who aren't bankrupt isn't news. * Just for fun... I'll give $10 to the first person who can tell me where I got the inverted Jenny stamp reference from. Just leave a comment below. You can use the $10 to buy some lottery tickets.